A popular image on Christmas themed social media right now is the wine bottle Christmas tree. These cool conversation pieces are nothing new, but the interest in bottle trees in general has sparked numerous articles, YouTube tutorials, and endless liked, pinned, and shared images. So, how do you make a wine bottle tree? Well, there are a few methods. The most fragile and precarious method is to stack bottles. Some bottle tree builders like to build their tree around a tall pillar lamp. Beer bottles are often more common on stacked trees because of the shape. A loose stacked tree is just rings of bottles stacked from the floor and depending on how wide of a base you want can take up to 2000 bottles! The end result is very impressive, but a loose stacked bottle tree shouldn’t be built in a place where it could be toppled. Unless you want to sweep up shards of glass practically all day! The chance of safety hazard is high on this one! The other stacked bottle tree method is a little more sturdy. The tree builder cuts out round pieces of posterboard and glues the ring of bottles in place. Double sided tape is sometimes used to place the next tier. Each base gets smaller and smaller till a tree is formed. Unlike a loose stacked tree, a base stacked tree can be done with any type of bottle. Tree builders often display a favorite beverage in this method. Although some builders like to scrub the bottle label off, there is a certain charm to leaving the labels on the bottles. It really just comes down to preference. These bottle trees are the most photographed trees. The tree itself is a metal stand or wooden post with spikes nailed into it for a tree appearance. These racks can be made from rebar or “Garden trees” can be purchased. Depending on how many spikes are on the frame, is how full the tree will look. Builders will sometimes tilt the bottle slightly to make it look like a more natural evergreen. These trees are still fragile and precarious, but the rack gives it a little more stability. A rack method tree is almost always made with wine bottles. A rack method tree can be as simple as 4 or 5 bottles stuck on a post or numerous bottle clustered for a more natural look. Most people find the hardest part of building one of these trees is coming up with the bottles. 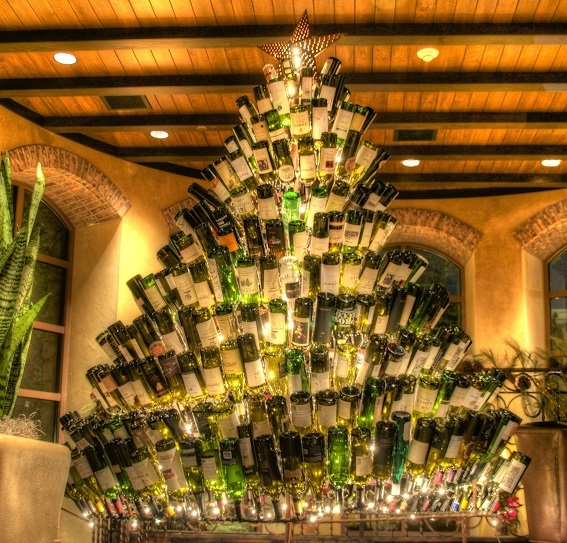 That is why a Wine Bottle Christmas tree can be a fun holiday activity for a group of friends. The more you drink, the more to fill out the tree! Bottle trees may be made of glass, but they can still be decorated to be festive. Tree builders tend to use Christmas lights to give their tree a lovely glow. 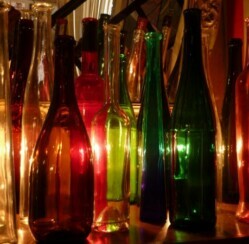 Lights can be strung around the base if the neck of your bottle is wide enough to hold the light. Or a brave soul can string the lights around the bottles. It’s also why loose stacked trees are normally built around a light source. Ornaments can still be hung as well, On a loose stacked tree the ornament hooks can be slide over the lip of the bottle, but on a rack tree they can be strung on a line to be wrapped around the bottles. Most people dare not chance “decorating” a bottle tree, but if you have a steady hand, go for it! Bottle trees are a popular this year because of the creativity of it. If you are tired of the same old tree, then give this DIY option a try! 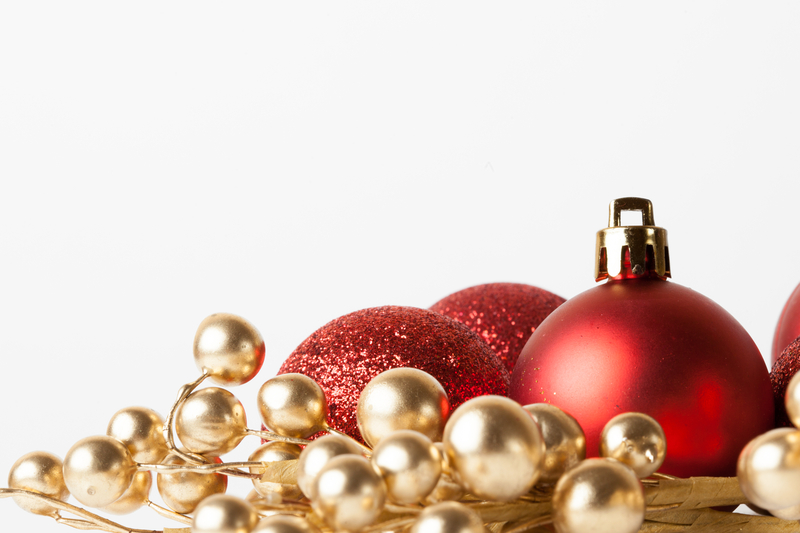 What a super fun alternative to decorating a real Christmas tree. I enjoy the real thing..sap and all but this would be a great adult modern spin to have somewhere else in the home too. I think it would be easy to find a slew of bottle for the tree..maybe even drink a few.. Great ideas.